Catalan brandies have a very long tradition. The alchemist Arnau de Vilanova distilled the first brandies in the court of Pedro II, Count of Barcelona, in the 13th century. On Site Lifestyle can offer you this historical experience - to understand and savour the delicate and painstaking process of wine and brandy production, to gain a unique insight from Master Winemakers and to enjoy the quality of the different wines and brandies over a gourmet luncheon set within Spanish vineyards containing Merlot, Pinot Noir, Cabernet Sauvignon and Chardonnay. There is a choice of accommodation from the memorable Ritz Carlton Hotel Arts in the centre of Barcelona, to other comfortable, central Barcelona hotels. Day 1: Arrive Barcelona and check-in to your hotel. Optional gourmet dinner in the El Cangrejo Loco, located nearby in the Port area. 10:00 Arrival at the Torres centre located in the Penedes region, close to Barcelona. Welcome followed by a private guided tour of the centre explaining the history of Torres. The tour begins at the splendid visitors centre with a video detailing the history in the projection room. After that you will be able to experience a year in the vineyards through the Tunnel of the Seasons, a new area recently opened for guests where you can experience the contrasts of the vine's annual cycle. Then a train will take you to the vineyards where the mythical Mas la Plana was born. You will learn about grape cultivation and harvesting and how the grapes are processed. The tour goes on to the vast underground storage cellars. Here you will walk among barrels and smell the wine as it ages. There will also be a tour to the Torres Foundation which is a private museum of the Torres Family history. At the end of the visit, we will take you a very short distance to lunch at our private restaurant at Mas Rabell. 12:00 Aperitifs will be taken outside in the garden of Mas Rabell, sampling the delicacies of Torres. 12.15 The welcoming private country house "Mas Rabell de Fontenac" dates from the 14th century. Its 45 hectares lie 330 meters above sea level and are overlooked by a fortified farm where the Fraternity of St. Michael of the Vines gathers to celebrate its chapters, thus fulfilling the solemn rites handed down since medieval times. This vineyard has an amazing collection of over 200 different grape varieties gathered from all over the world. A wonderful three course luncheon will be served, inclusive of different vintage wines, brandies, mineral water and coffee, hosted by a member from the Torres House. Further fascinating insight will be gained through their knowledge and anecdotes. For this tour, the minimum number of guests for lunch is 12 during Monday-Friday. For Saturday lunch, the minimum number is 50. Further optional cultural visits may be planned, such as a visit to Barcelona, an authentic tapas lunch, a visit to Barcelona FC or a participant activity such as golf or ballooning for example. There are also superb beaches close by. Alternatively, the venue may be combined with a meeting or conference. On the shores of the Mediterranean and overlooking the Olympic Port, this striking contemporary hotel enjoys a spectacular beachfront location near Barcelona's finest shops and restaurants. 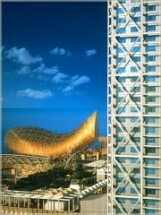 The graceful silhouette of the Hotel Arts Barcelona offers guests spectacular views over the city and sea. Attention to detail is a mark of a great hotels and the Arts does not disappoint; there is a 24 hour room service and a housekeeping service twice a day to ensure that everything stays in perfect order. In addition, the hotel features comfortable rooms with air conditioning and temperature control; marble bathrooms with independent bath and shower; Bang & Olufsen sound system and television with access to satellite channels and video; fax, PC and high-speed Internet access, two telephone lines and an automatic answering machine. 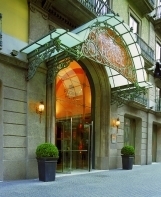 This 4 star hotel is located in the heart of Barcelona, only 50 metres from Plaza Catalunya. It is also very close to the Ramblas and a short walk to the historic Gothic Quarter. Built in 1917 it has kept the charm and tradition for which it has been distinguished, and has a remarkable art nouveau style entrance to the hotel. There are 99 elegantly decorated guestrooms all well-equipped to ensure your stay is enjoyable. The hotel has a business centre, restaurant, bar and library. Every effort is made by the efficient management and staff to ensure that guests are provided with efficient and personalised service while staying in Barcelona.